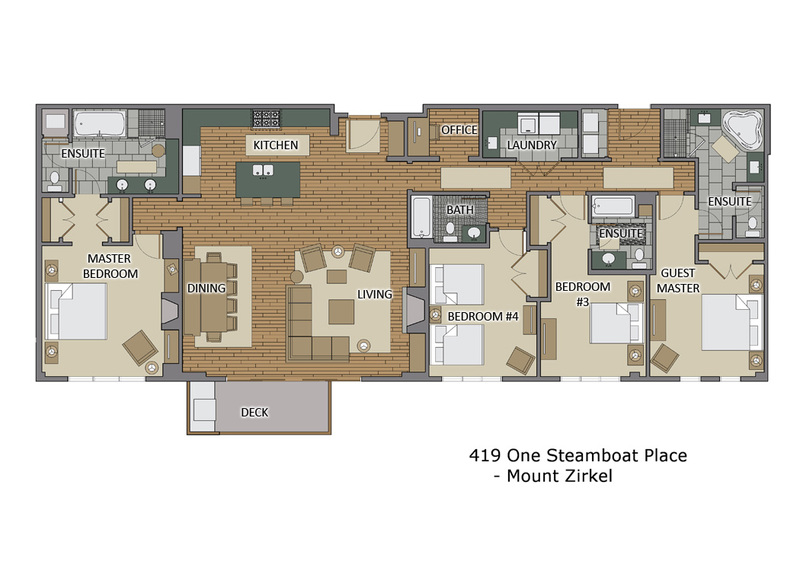 The Mount Zirkel residence at One Steamboat Place offers ultimate ski-in/ski-out access and luxurious accommodations just steps from the Steamboat Gondola. The Mount Zirkel Residence features a large living area with valley views, and its open floor plan connects the living and dining areas to the kitchen with plenty of room for the entire group to gather. State of the art a/v equipment including a 4K Ultra HD 55" TV provides high-definition entertainment after a full day of activity. The professionally equipped kitchen with everything you need including Viking appliances will delight the chef in your group. You can grill outside on the built-in Viking gas grill on the deck. OSP residences are designed for entertaining. There is seating for 10 at the dining table and room to seat more at the kitchen island. All One Steamboat Place residences feature rich colors, natural textures, and sumptuous fabrics throughout the home. Each master bedroom offers a gas fireplace. The main master bath features a steam shower and Jacuzzi tub and bidet. In this residence 3 bedrooms offer a King bed with private bath, and the fourth offers a Queen bed and bunks with two full beds, all with a private bathroom - great for kids. The home office boasts an iMac home computer with printer and high speed Wi-Fi allowing Internet service for all guests. A printer is also available at the front desk. Guests can also videoconference with the front desk from the home office.